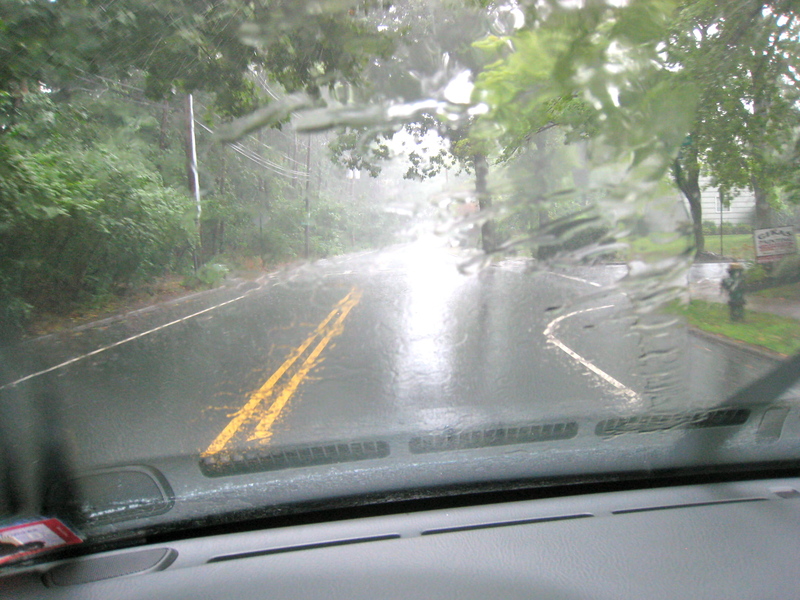 Driving in the pouring rain is not fun. It rained. No, let me rephrase that. It poured. It teemed. It rained so hard all of our local roads were flooded or near flooded. And I was supposed to drive to Central Jersey today to have lunch with my sister Cindy. I tried. Yep. I tried to negotiate the puddles and rain, but to no avail. The Garden State Parkway was flooded, particularly around Exit 140 so I didn’t get far. Cindy understood though. I left her a voicemail (since she’s at work she doesn’t pick up) letting her know the road conditions. She texted me back a while later reminding me that what I did was correct. “Safety first.” That said, I’m bummed I couldn’t see her today and share a few stories and laughs and hugs over lunch. It's a little blurry, but you get the idea, right? Love you, Cindy! On the way home I took a short video of what I was seeing through my windshield. Take a look at “My World and Welcome to It” if you have a minute.And I ended up back at home all dressed up with no place to go! So I walked around outside for a few minutes before the rain chased me into the house. 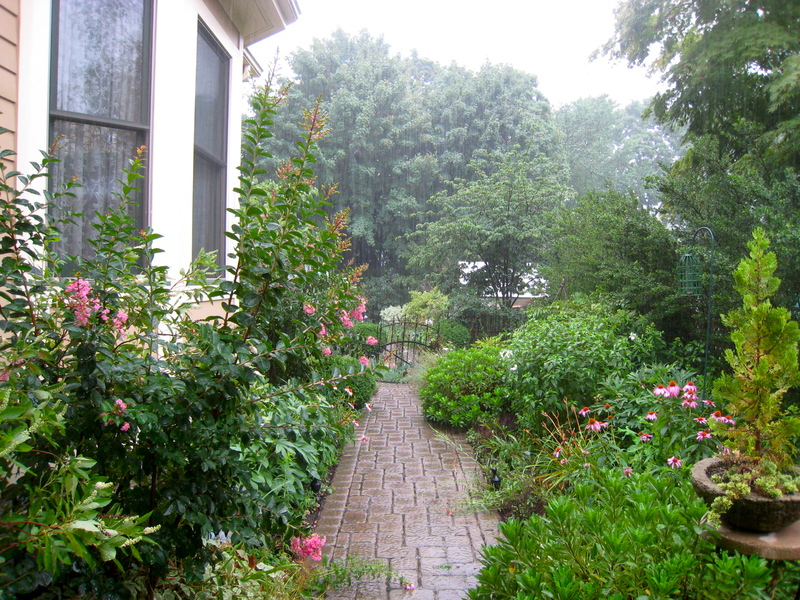 The great thing about the ‘bad weather’ is my gardens, parched for a few weeks, are getting some much-needed rain. In fact, some of the shrubs were doubled over from the weight of all the rain. Drink up my green friends since we don’t know when the next rainstorm will occur! My garden is happy, albeit a little overwhelmed with so much rain in so short a time! I watched the rain fall onto the pavers next to the front steps. Even though the rain is ‘noisy,’ it’s pretty soothing to watch it fall. 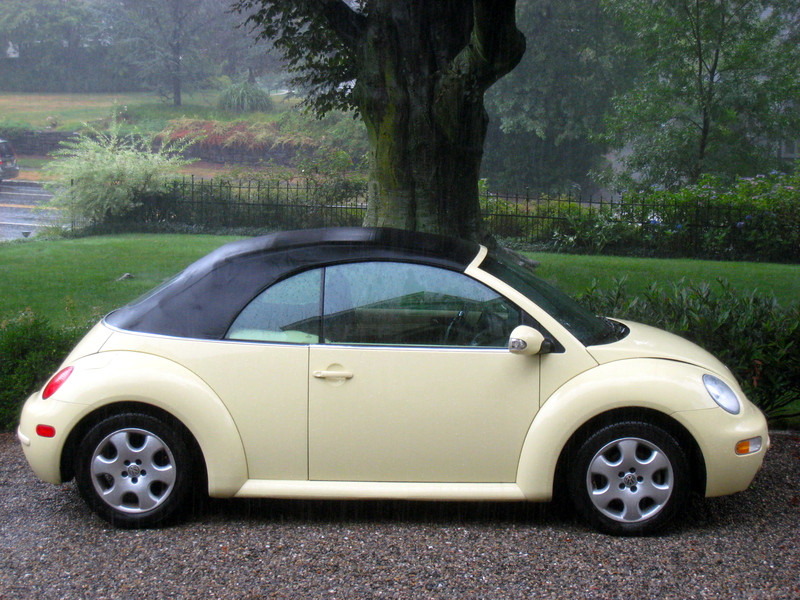 And take a look at my daughter Tory’s beloved VW Bug! Even Sunny, in all her yellow glory, looked a little gloomy today. Sunny was drenched; she looked a little forlorn today.